So many people think it’s natural and normal for their gums to bleed. “I know I’m cleaning really well if I can make my gums bleed.” “Oh, it’s just gingivitis.” And to that I have to ask, Do your elbows bleed when you take a shower? Well, they shouldn’t, and neither should the gums. Bleeding gums represent an open wound in one of the most contaminated parts of the body, bar none. And beyond bad breath there are a whole slew of effects on the whole rest of the body as the bacteria and bacterial waste-products seep down into the rest of the system: heart, blood vessels, lungs, kidneys, brain, reproductive organs, joints, etc., etc…. Some of these things can be deadly. If the direct effects are not bad enough, there are secondary inflammatory stimulatory effects on the immune system, and these effects can lead to wide-ranging damage. Some of the targets and diseases are listed below. Click next to them to read in more depth. Clearly, this picture from Walter Loesche is WAY beyond gingivitis. But one can easily see the tremendous surface area of raw, exposed connective tissue and its associated vasculature, a pathway directly into the circulation. This is frank periodontitis. Gingivitis is much more subtle and hard to notice but can represent another great source of ingress into the bloodstream. develops in about 15% of all people who are ventilated, is among the most dangerous. on a mechanical ventilator can easily develop serious infections — as 26,000 Americans do every year. Thanks to a proven new clinical approach developed by Tel Aviv University nurses, though, there is a new tool for stopping the onset of VAP in hospitals. Raanan, who works at the Sheba Academic School of Nursing at The Chaim Sheba Medical Center, collaborated with a team of nurses at major medical centers around Israel. The nurses found that if patients — even unconscious ones — have their teeth brushed three times a day, the onset of pneumonia can be reduced by as much as 50%. It’s difficult to quantify the effects precisely, the researchers say. “While the research shows a definite improvement in reducing the incidence of hospital-borne pneumonia, it’s hard to say by exactly how much toothbrushing prevents VAP,” says Raanan, but the published evidence shows a direct correlation for intubated patients. kills the growth and subsequent spread of the bacterium that leads to VAP. mechanical suction device to remove secretions from the mouth and throat. They also put patients in a seated position and change the position every few hours. Toothbrushing, say Tel Aviv University nurses, should be added to the routine. patients, these new results may convince medical centers around the world to invest more resources in this routine practice, thereby saving lives. Seymour GJ, Ford PJ, Cullinan MP, Leishman S, Yamazaki K.
Oral conditions such as gingivitis and chronic periodontitis are found worldwide and are among the most prevalent microbial diseases of mankind. The cause of these common inflammatory conditions is the complex microbiota found as dental plaque, a complex microbial biofilm. Despite 3000 years of history demonstrating the influence of oral status on general health, it is only in recent decades that the association between periodontal diseases and systemic conditions such as coronary heart disease and stroke, and a higher risk of preterm low birth-weight babies, has been realised. Similarly, recognition of the threats posed by periodontal diseases to individuals with chronic diseases such as diabetes, respiratory diseases and osteoporosis is relatively recent. Despite these epidemiological associations, the mechanisms for the various relationships remain unknown. Nevertheless, a number of hypotheses have been postulated, including common susceptibility, systemic inflammation with increased circulating cytokines and mediators, direct infection and cross-reactivity or molecular mimicry between bacterial antigens and self-antigens. With respect to the latter, cross-reactive antibodies and T-cells between self heat-shock proteins (HSPs) and Porphyromonas gingivalis GroEL have been demonstrated in the peripheral blood of patients with atherosclerosis as well as in the atherosclerotic plaques themselves. In addition, P. gingivalis infection has been shown to enhance the development and progression of atherosclerosis in apoE-deficient mice. From these data, it is clear that oral infection may represent a significant risk-factor for systemic diseases, and hence the control of oral disease is essential in the prevention and management of these systemic conditions. Background: Periodontitis has recently been identified as a potential risk factor for systemic pathologies such as cardiovascular disease, the hypothesis being that periodontal pockets could release pro-inflammatory bacterial components, for instance endotoxins, into the bloodstream. It is known that the oral cavity can be a source of circulating bacteria, but this has never been shown for bacterial endotoxins, and no evidence exists so far that the risk of systemic injury is related to the severity of periodontitis. The aim of the present study was to test the influence of gentle mastication on the occurrence of endotoxemia in patients with or without periodontal disease. Methods: A total of 67 subjects were periodontally examined and grouped according to their periodontal status. This classification was based on an original index of severity of periodontal disease (periodontal index for risk of infectiousness, PIRI) aimed at reflecting the individual risk of systemic injury from the periodontal niches. Thus, the patients were classified into 3 risk groups: low, PIRI = 0; n = 25; moderate, 1 ≤PIRI ≤5, n = 27; and high 6 ≤PIRI ≤10, n = 15. Blood samples were collected before and 5 to 10 minutes after a standardized session of gentle mastication for detection of circulating endotoxins. Blood samples were tested with a chromogenic limulus amoebocyte lysate assay. Results: Overall, blood levels of endotoxin after mastication were found to be significantly higher than before mastication (0.89 ± 3.3 pg/ml versus 3.0 ± 5.8 pg/ml; P = 0.0002). Likewise, the incidence of positive endotoxemia rose from 6% before mastication to 24% after mastication (P = 0.001). When accounting for the PIRI index, endotoxin levels and positive endotoxemia proved to be significantly higher in patients with severe periodontal disease than in the subjects with low or moderate periodontitis. Conclusions: Gentle mastication is able to induce the release of bacterial endotoxins from oral origin into the bloodstream, especially when patients have severe periodontal disease. This finding suggests that a diseased periodontium can be a major and underestimated source of chronic, or even permanent, release of bacterial pro-inflammatory components into the bloodstream. Bacteria associated with periodontal disease have been linked to other serious health risks. Contribute to the development of heart disease, the nation’s leading cause of death. Increase a woman’s risk of having a preterm, low birthweight baby. disease. Severe periodontal disease, or periodontitis, involves bone loss and diminished attachment around the teeth. 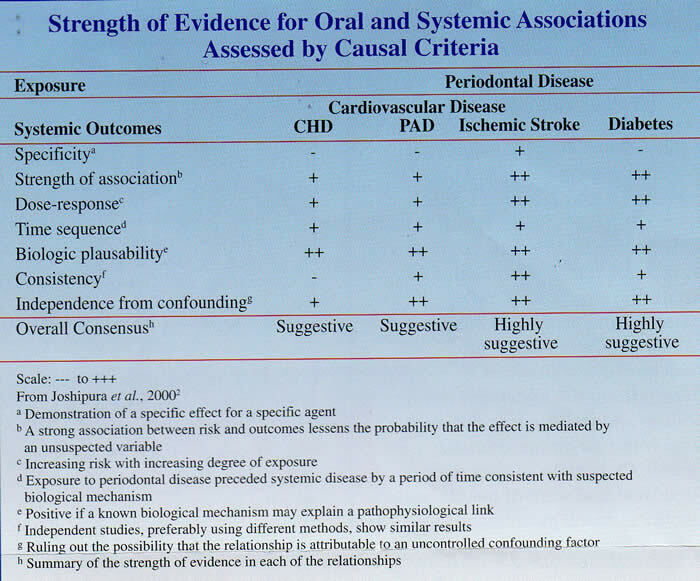 Periodontitis and Cardiovascular Diseases – Comorbid Conditions?